Poetry is where you find it, I’ve heard, but this “found poem” is one I was wonderfully predisposed to be warmly attracted to at first sight. It came from a member of my own family, a family not generally known for its poetic enthusiasms, a member with no previous convictions about verse that I knew of. In a way yet unexplained — and I’m thinking that I very well may not want to know whence it came to her — life brought her a piece of cummings. Her routinely warm and generous heart sent it to me as a birthday tribute to my wife, the same impulse that led me to murder a Paul Simon song for the glory of love. 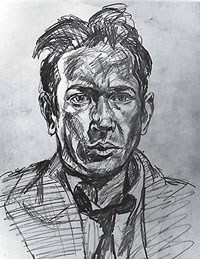 A sketched self-portrait from 1920, the same year as this poem was made.